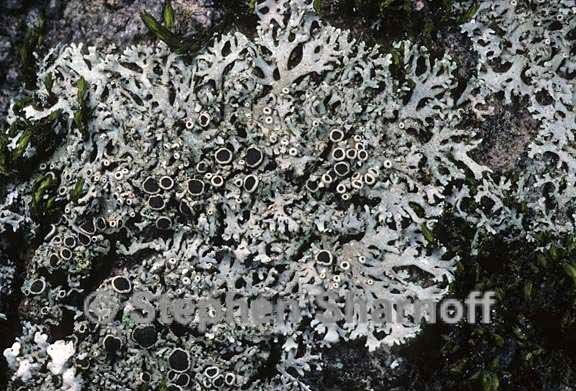 Thallus: foliose, up to 4.5 cm in diam., irregular to more often orbicular lobes: elongate and discrete to somewhat irregularly rounded and partly imbricate, 0.4-1.5 mm broad, +flat, prostrate upper surface: gray to gray-brown or brown, epruinose, sometimes developing +continuous, gray, epinecral layer, especially in older parts; without soredia or isidia but sometimes developing irregular lobules or tubercles centrally in old specimens upper cortex: paraplectenchymatous medulla: white lower cortex: paraplectenchymatous lower surface: black, sometimes paler at the lobe ends, dull to weakly shiny; rhizines: simple, black Apothecia: frequent and usually present, up to 2.5 mm in diam., sessile; margin: entire or becoming irregularly crenate or lobulate in older ones, usually with a corona of rhizines (cilia) ascospores: ellipsoid, 17.5-24 x 7-10 µm, Physcia-type Spot tests: all negative in cortex and medulla Secondary metabolites: none detected. Substrate and ecology: usually on bark, occasional on rock World distribution: North America and Europe Sonoran distribution: mountains of Arizona, at 1675-3000 m, and Sonora. Notes: In size and form, Phaeophyscia ciliata is most similar to P. sonorae, which is easily distinguished by its white to pale tan lower cortex and its patchy, inconspicuous epinecral layer. Physciella nepalensis is also superficially similar, but the lower cortex is pale and prosoplectenchymatous. One fragmentary saxicolous specimen from Arizona may belong to a new taxon, which is known more commonly from areas in the central Rockies. It has thicker, broader lobes, a less regular growth form, and often a thick, +continuous epinecral layer.